Explanation: When and where do clouds form on Mars? The Mars Global Surveyor spacecraft currently orbiting Mars is finding out. 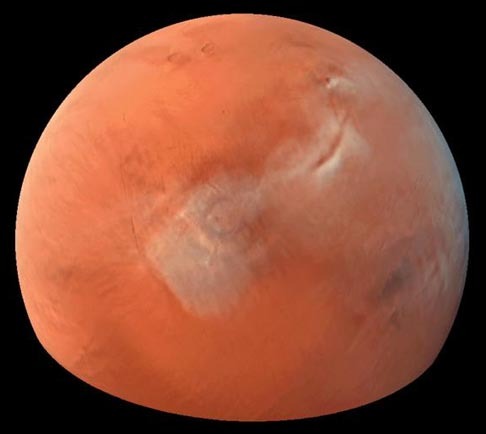 Photographs released last week showed clouds forming above Tharsis, a huge bulge on Mars about 4000 kilometers across and 7 kilometers high containing several large volcanoes. These clouds temporarily disappeared as a large dust storm emerged from the South, the first developing dust storm to be tracked by an orbiting spacecraft. Mars Global Surveyor continues to aerobrake during on its ongoing mission to survey the planet Mars.